Daily standups without standing up. 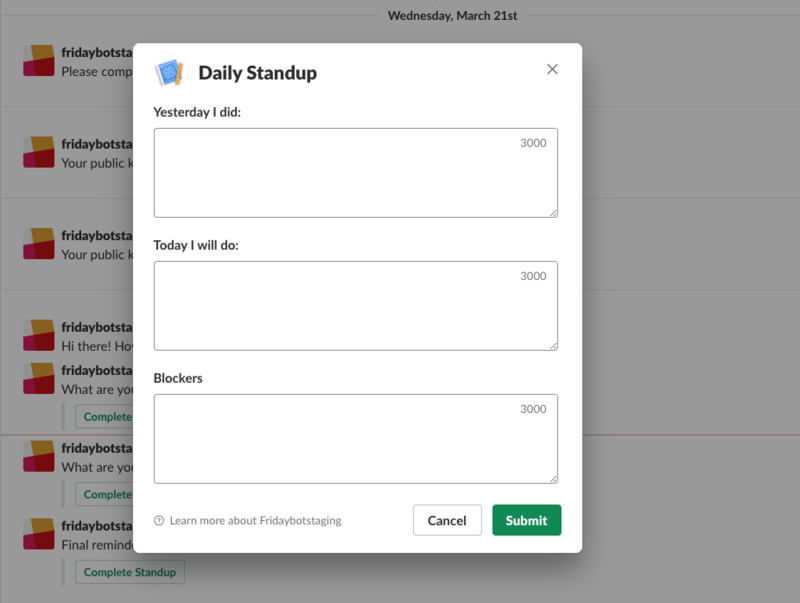 Daily Standups make it easy to share accomplishments, progress, and blockers with others on your team, helping improve productivity and alignment. With Friday, you can quickly share what you are working on asynchronously (over email or Slack). Spend more time in the zone solving problems and less time talking about them. How do daily standups work? This regular event creates a fast feedback loop inside a team, ensuring that people are free and clear to do their best work. In highly collaborative environments, it's important that team members are aware of how their work effects others on their team. Daily standups create a space to align a team and uncover ways to improve process. We are huge fans of this approach and believe standups are a critical process to a well-functioning team. The majority of the time team members are simply sharing information (what they accomplished yesterday and plan on doing today). This can be done online instead and referenced on an ad-hoc basis. As more and more teams are distributed, it becomes increasingly difficult to coordinate people across various timezones. We've had coworkers join morning standup meetings at 8pm at night in their timezone. People start building their schedule around the daily standup, punting in-depth work that requires little distractions until after the scrum meeting occurs. People work better at different times of the day and a fixed, regular meeting reduces one's ability to work when they are most productive. 15 minutes every day is expensive over time. A team of five engineers paid $100k annually ends up costing almost $100/day (or $2500/month). Important information is shared, but is not visible to people outside the standup, increasing the chances that someone will ask you what the status is on a certain project. Team members can complete a standup when they are not doing "deep work"
Standups can be shared across the company, ensuring that teams are aligned and aware of what's happening. They can be referenced over time, enabling better conversations. Teams can save hours every week. Team members don't have to stand and listen to one person talk too long about something very few people care about. 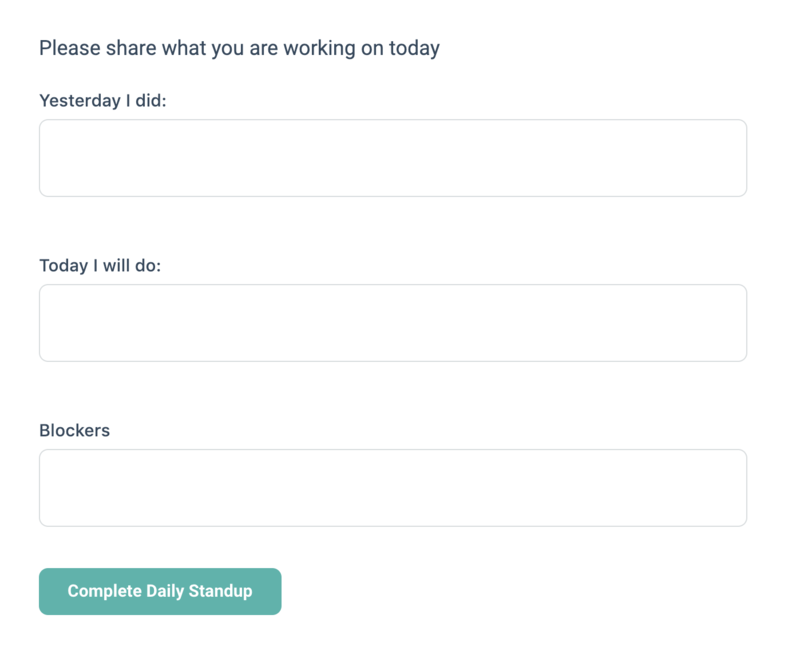 With Friday, your team can easily complete a daily standup without leaving Slack. Results are pushed into a channel so your team can see what's going on. In addition, the information is fed into Friday for each team, making reporting easy. Individual standups can be referenced over time on each person's profile. Try Friday for free with your team and see how it can improve productivity and connectedness.